In my opinion, pork is the king of meats. And the humble pork chop cooked to perfection is the ultimate expression of all that’s good and tasty about putting pork on your fork. But cooking this cut can prove tricky. Without the proper care, you can easily wind up with a dried out, tasteless piece of meat. To help you avoid that fate, I’ve developed this simple recipe that delivers a crisp-on-the-outside, moist-on-the-inside chop, consistently. Even if your cooking skills are minimal, this formula should prove pretty much fool-proof. My secret is twofold: brining for tenderness and a sugar accented spice rub for an awesome caramelization. 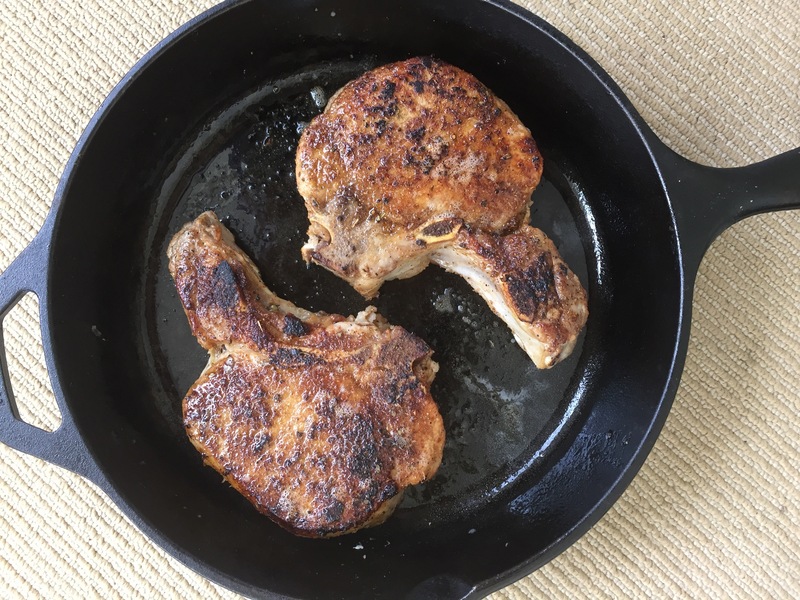 If you have one, I highly recommend using a cast iron pan to cook your chops. It’ll provide the high intensity heat that you need to develop a beautiful crust. In a medium saucepan, combine the sugar and salt with 2 cups of water. Over medium heat, stir until the sugar and salt have dissolved. Pour into a casserole dish and let cool. When cool, add the pork chops, making sure they are submerged. (If you cannot fully submerge the chops, flip them halfway through the brining time. Let the chops sit in the brining liquid for at least 1 hour, or up to overnight. Meanwhile, in a small bowl, combine the brown sugar, cumin, coriander, onion powder, and oregano. Remove the chops from the brine and rinse them off under cold water then pat dry with paper towels (if you like your food on the saltier side, skip the rinsing and just pat dry). Place the chops on a cutting board and rub both sides with the spice mix. In a large frying pan (preferably cast iron) heat 1 tablespoon of the oil over medium heat. When the oil is hot, add two of the chops and cover with a lid. Cook on one side for about 3 minutes, until browned (feel free to peek to make sure they don’t brown too quickly due to the sugar). Flip and cook, covered, for a further 3 or 4 minutes, depending on how well-cooked you like your pork. Remove from the pan and let rest. Repeat with the remaining oil and chops. Let rest for 2 minutes and serve sprinkled with pepper to taste. This entry was posted in main and tagged brine, meat, pork, pork chop, spice rub. Bookmark the permalink.